Take a look through some recent projects to see if these examples inspire any quilting ideas for your top! This is just the beginning of what's possible. Always keep in mind that quilting scale can be easily adjusted for your preferred quilting density. This is a modern quilting design that’s sure to accentuate angular lines found in flying geese units or half-square triangles. It’s shown here on a fabulous quilt by Sarah Bennett-George. This panto has a simple repeated diamond shape with a bit of flare added to each in the form of loops. This design looks best at a smallish scale. The quilt shown was made by members of the Central Iowa Modern Quilt Guild. Full disclosure: I don’t “get” why some quilters don’t like feathers. I mean, cmon! That’s gorgeous! This pantograph looks so classy and timeless. This panto is feels both feminine and elegant and will add the perfect touch of “pretty” to the right quilt top. It is shown here on Pen + Paper Pattern’s Geo Weaver quilt. Morgan Alexander made this Meadowland quilt and named this simple panto I created. Circles with dashes in between! Fun and very effective. 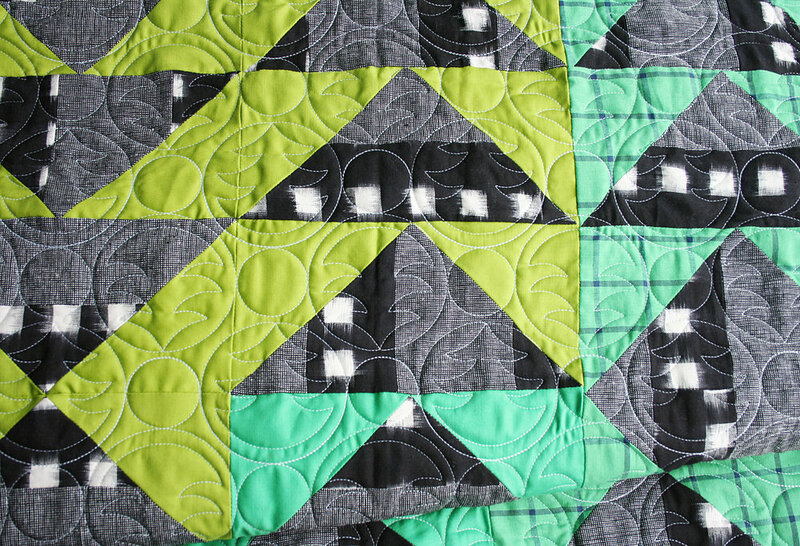 This pantograph has a maze-like quality that just happens to look a-mazing (jokes) on this Modern Fans quilt, made by Tina Cernugel. The pattern is by Suzy Quilts. 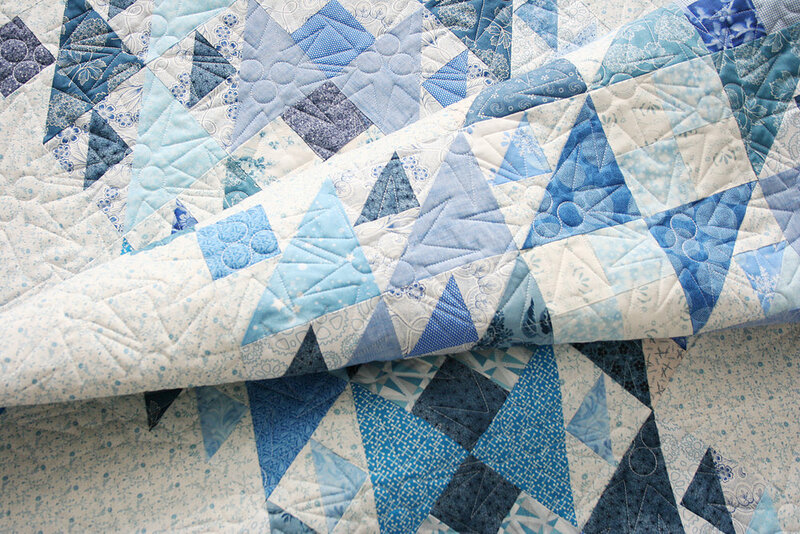 Melissa Huether’s Feathered Star Blizzard quilt looks gorgeous with this snowflake themed panto that features different types of snowflakes. It’s a classic! The results are amazing and it’s so versatile! The pattern shown here is Take Heart by Angela Pingel. This one is perfect for the Christmas season! 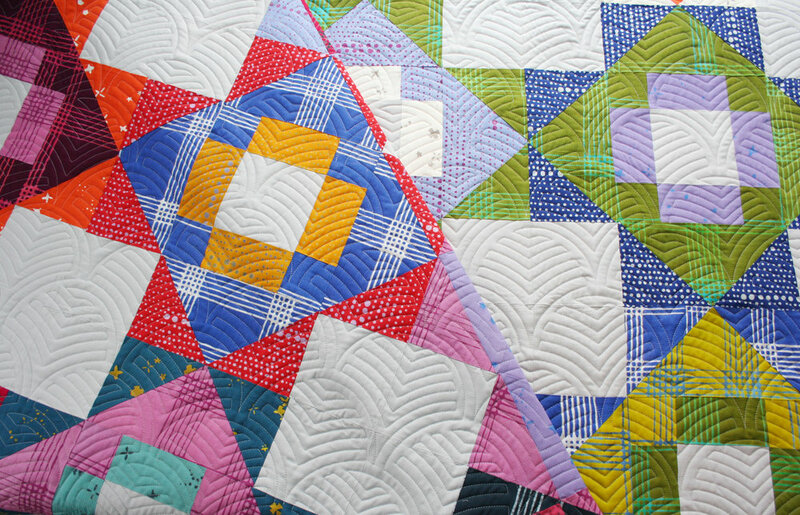 It’s shown here on Meghan Buchanan’s Jawbreaker quilt. This is another great panto for any water themed quilt, but it don’t limit it to just that! 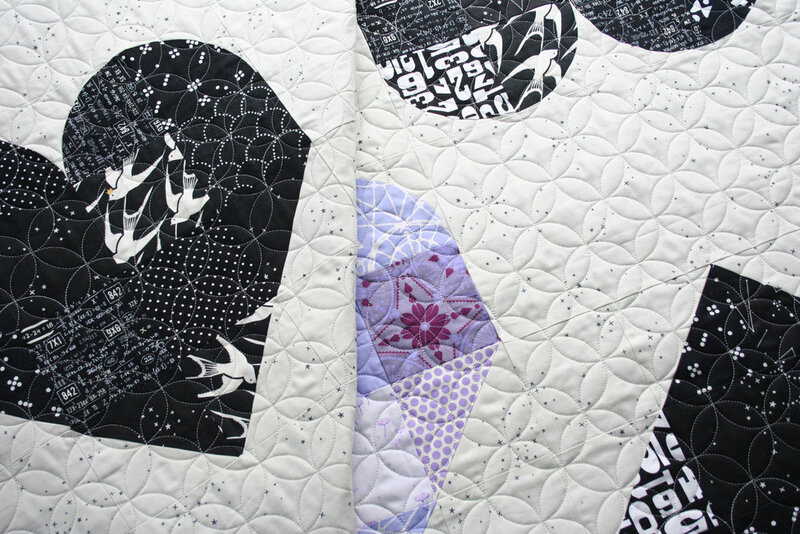 It’s shown here on Angela Pingel’s Hidden Agenda quilt. This panto is great for patriotic quilts, holiday quilts or kids quilts. Quilt by Carol Kandoll. I was so happy with how Chancel stitched out on one of my own quilts! The center block for this medallion quilt was made using my Fierce Feathered Star pattern (no y seams and no paper piecing!). We used a double layer of batting to fabulous results using this panto with all the flower power! Boardwalk is a beauty in any scale! Here it is stitched out on Brittany Lloyd's Shades of Citrus quilt. Scale is everything! The larger scale wishbone is perfect for a snuggly quilt but it can be made much smaller for a texture-rich look as shown above. Julie Doy is the quiltmaker and the pattern is called All Around the Square from Jessica Plunkett of Maeberry Square. This panto reminds me retro tiles. It’s sooooo cool looking stitched out! It’s shown here on Brittany Lloyd’s Celtic Crossing quilt. I love this one because it reminds me of the spirals that were a go-to in my hand-guided quilting days. I opted to shrink this panto down to a very small scale so that the design was very dense. It would also look great on a larger scale. Shown in a not-too-dense scale, this quilting is minimal but stylish. I mean... how perfectly sweet is this panto? It's looking great here on Doris Brunnette's rainbow baby quilt! This is another great choice when style and simplicity are key. 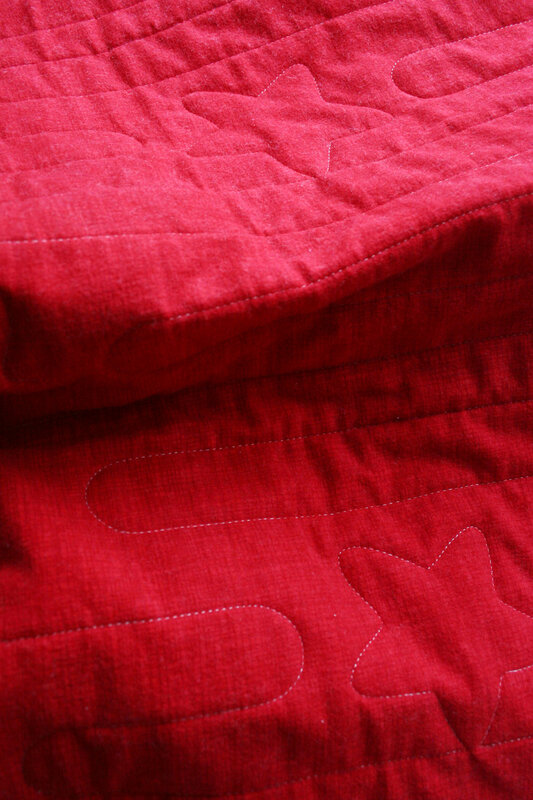 The scale shown about is perfect for maintaining the soft drape of a quilt when you really don’t want dense quilting. Quilt by Jessica Plunkett in her own design. The pattern is called In the Right Direction and is available here. This is a whimsical panto that adds dimension to any top. The echoed lines are reminiscent of a topological map and adds movement without taking over a top. What more is there to say about this one? Isn’t it so pretty? It’s light and airy and reminds me of what I like most about free motion quilting–you take a fairly simple shape and repeat it until it’s blowing your mind! :) The overall effect is so neat! Horizontal lines and right angled goodness... for when plain straight line quilting won't do. Play up the geometric look while enjoying the random-enough-to-be-hand-guided effect! I stitched this panto out in a very small scale, but it also looks wonderful stitched out in its full 12-inch glory! This panto is a modern classic! The quilt shown above was made by Marilyn Elfes. Perfect for modern looking quilts. It especially plays nicely with bold geometric design and can be positioned horizontally or vertically with spacing at any interval you'd like. I love the spacing, curves and shapes of this panto! Add this one to a floral or otherwise "organic" top. This panto has it all: a modern look, gentle curves and echoing lines. It’ll bring a lot of visual interest to a variety of quilt tops. The pattern here is the Meadowland quilt by Then Came June. Quiltmaker is Johannah English. 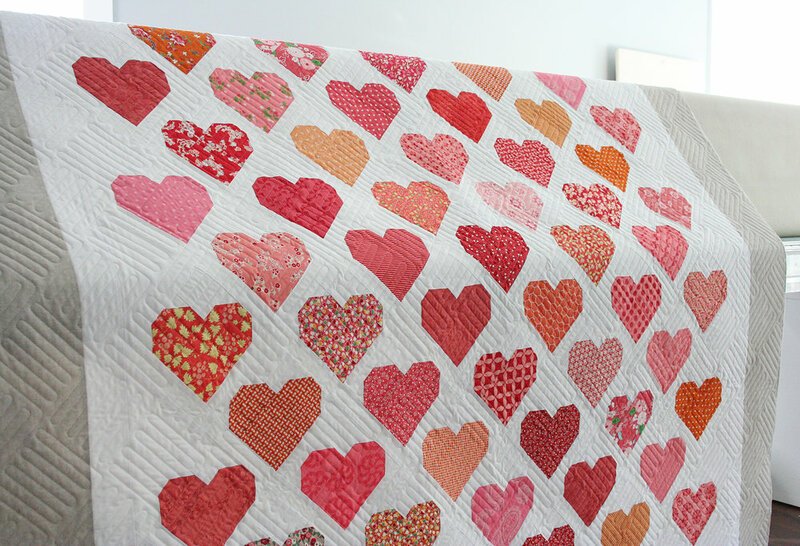 Shown here on Lo & Behold Stitchery’s Interwoven quilt, this design can be dainty, simple, classic and fun. This panto can take on the look of the winter holidays, but it definitely doesn’t have to. Angled lines and circles together make for a really interesting texture. Quilt by Marge Pearson. This is a sideways shot, so you’ll have to use your imagination a bit. Two rows of wavy lines followed by a row of varying sizes of circles. It would also look nice for a water theme! Quilt by Marge Pearson. 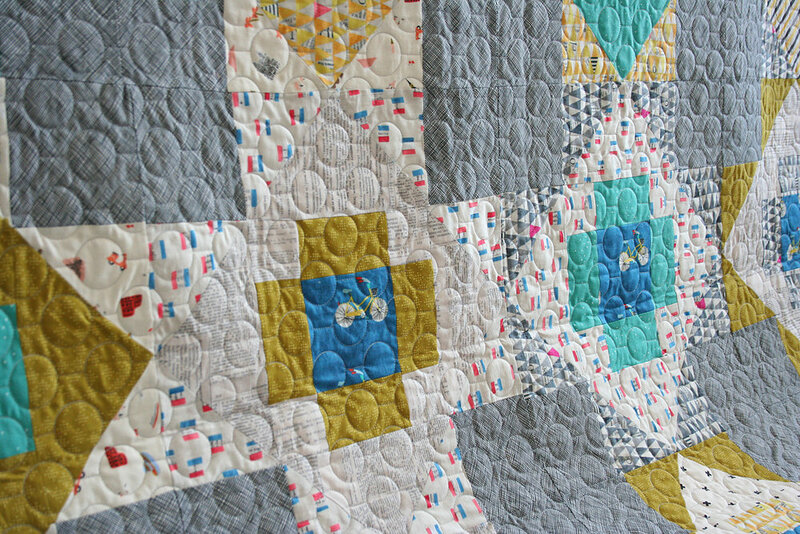 Another Meadowland quilt by Morgan Alexander, this pantograph is simple and fun. In case you haven’t noticed, I think that the curvy + straight lines yield fabulous results! Simple elegance on this quilt made by Janeen Pearson. Interesting secondary patterns. Are you dying of cuteness??? Let this vintage inspired design show off your next quilting project! If you like geometric + abstract patterns, this is a great one to try! This quilt is by Meghan Buchanan of Then Came June. It’s her own pattern called Meadowland. A holiday/wintery offering for your seasonal quilts! This is another Meadowland quilt by Then Came June. 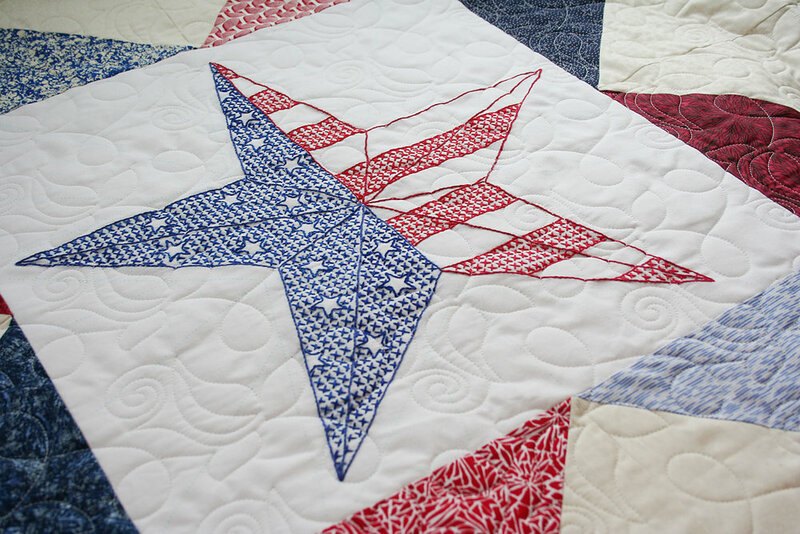 Perfect for those patriotic quilts! This was stitched out for a very utilitarian quilt, we can always go smaller on scale. This holiday/wintery panto has a lot of variation to keep things fun and interesting. I made this quilt (pattern is called Triangle Peaks by Emily Dennis) and *knew* this panto would be perfect for it! 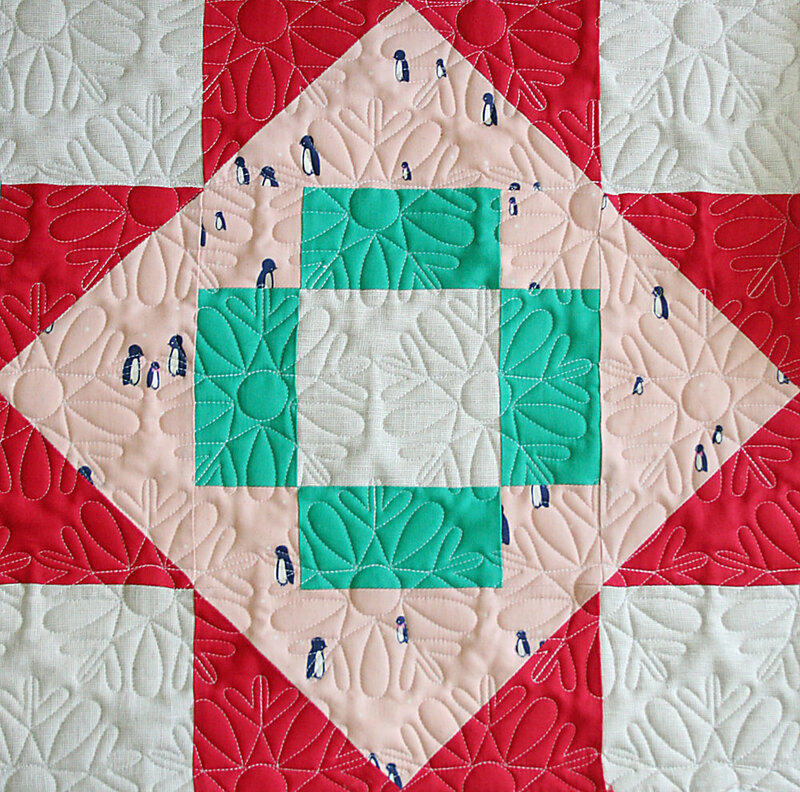 This quilting style goes wayyy back! But that doesn’t make it any less stylish. ;) Because it is technically difficult to execute, this panto costs more than standard rates. If you are interested in a similar look, check out the baptist clams panto below (that one is standard pricing). Quilt above by Lindsey Neill of Pen + Paper Patterns. Abacus is a fun panto when you want great texture, but don’t want to overpower the patchwork. It’s lovely back and forth lines give subtle visual interest while maxing out on texture! Quilt made by Gail Zerbe, pattern by Aqua Paisley Studio. This panto has lovely flowing lines and would be a great compliment to any florally themed quilt top. Anne Franzen is the quiltmaker of this featured quilt. This motif looks like little repeating flames. Simple + cute! Laura made this quilt with Then Came June’s Meadowland pattern. And here is an example of the Bubbles panto stitched out in a smaller scale. This t-shirt quilt was made by Mary Brunkhorst. Named after Lindsey of Pen + Paper Patterns, this panto was a creative collaboration between the two of us. This is a modern classic and is amazingly versatile! This modification of the traditional orange peel quilting adds a touch of elegance to a top. Pattern is Vintage Lace by Lo & Behold Stitchery. 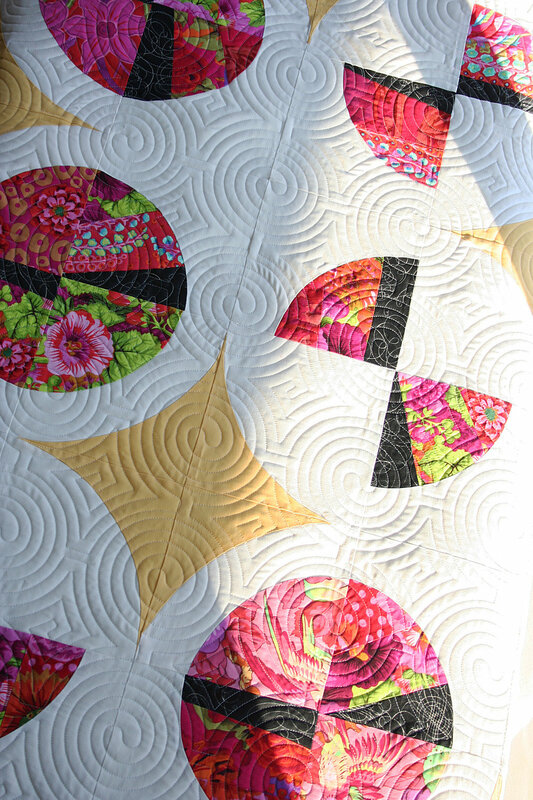 Whimsical and fun, this quilting will add curvy-interest to your top. Sarah Bennett-George's quilt cried out to me for this panto! It turned out so great! If you like feathers, but like, soft not-too-over-the-top feathers, you'll love Fuchsia! It's got a softness to it and a flow that just feels right. It's shown on Brittany Lloyd's quilt called Christmas Joy. Pick this fun panto for lots of movement and wonder! These lines can run either vertically (shown) or horizontally across your quilt top.